The W.A. 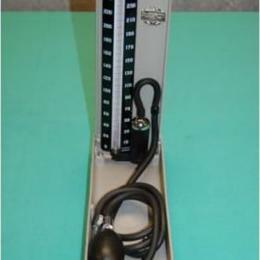 Baum Company Kompak Model (260 mmHg) Sphygmomanometer is perfectly suited for the clinical environment or the traveling professional who needs only the most accurate blood pressure measuring device in the world. Every Baumanometer® instrument is a true gravity manometer. It is set apart from others as the world standard since 1916 for blood pressure measurement by a simple principle: devotion to uncompromising quality. The Baumanometer® Kompak Model features a large bore, Mylar® Clad glass cartridge tube, our Calibrated® V-Lok® Inflation System and a diecast aluminum alloy case. It is a precisely calibrated clinical sphygmomanometer, designed for medical practitioners who require a strong, lightweight, portable instrument that offers scientific accuracy and years of trouble-free service. Like all Baumanometer® instruments, it is backed by our manufacturer's guarantee. The case is made of lightweight aluminum alloy. The instrument color is Neutral Gray textured baked enamel. The aluminum scale has large white epoxy numerals on a black anodized background.